...allows nonresident students to enroll in a school administrative unit's online learning program, with the school administrative unit of residence for that student to pay the enrolling school administrative unit the student's tuition for the program. The bill also directs the Department of Education to create a stakeholder group to study the opportunities in and challenges of creating one online learning program for the State and to report to the Joint Standing Committee on Education and Cultural Affairs by January 4, 2012. ...amendment strikes and replaces the bill to provide several provisions that allow nonresident students to enroll in a school administrative unit's online learning program, with the school administrative unit in which the student resides providing the student's tuition payment to the enrolling school administrative unit for the online program. The amendment accomplishes the following. 1. It expands the eligibility provisions to permit a student to enroll in an online learning program or course that is offered by a school in a school administrative unit, a private school approved for tuition purposes that enrolls at least 60% publicly funded students or an online learning provider approved by the Department of Education and provides that a school administrative unit must pay for an online course that meets the content area requirements of the system of learning results when the school administrative unit does not offer the course or the student cannot take the course for certain reasons. These eligibility and course offering provisions are repealed July 1, 2015. 2. It establishes a 3‑year pilot project, including eligibility provisions, for enrolling students in full-time online learning programs, beginning in the 2012-2013 school year and ending in the 2014-2015 school year. The pilot project provisions are repealed July 1, 2015. 3. It establishes provisions pertaining to online learning programs and online course offerings that a school administrative unit may offer to students who reside in the school administrative unit and to students who reside, and whose parents reside, outside of the school administrative unit or outside of the State. These provisions are repealed July 1, 2015. 4. 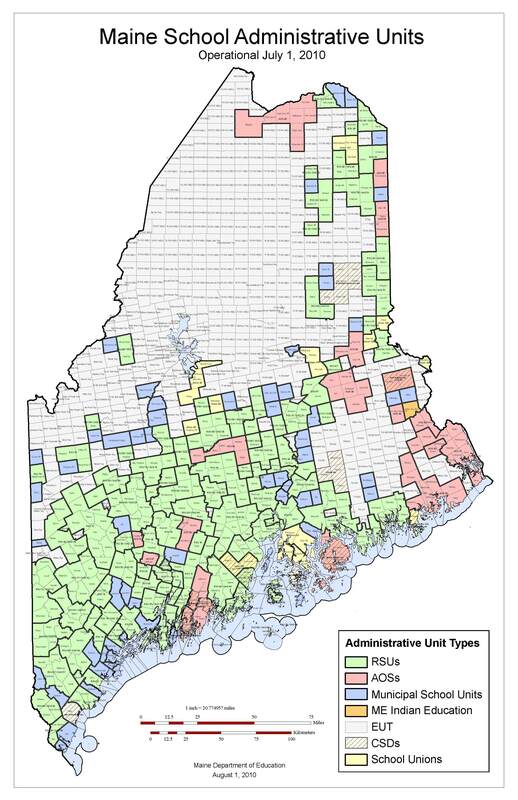 It provides that school administrative units must provide at least $5,000 in funding for students who meet the eligibility requirements to enroll in online courses and authorizes a school administrative unit to provide more than $5,000 in funding when the superintendent provides permission for an eligible student to enroll in an online course. The funding provisions are repealed July 1, 2015. 5. It directs the Department of Education to provide information on online learning programs and courses offered by eligible providers on the department’s publicly accessible website. This provision is repealed July 1, 2015. 6. It directs the Department of Education to create a working group to study the opportunities in and challenges of creating one online learning program for the State and to report to the Joint Standing Committee on Education and Cultural Affairs by January 4, 2012. 7. 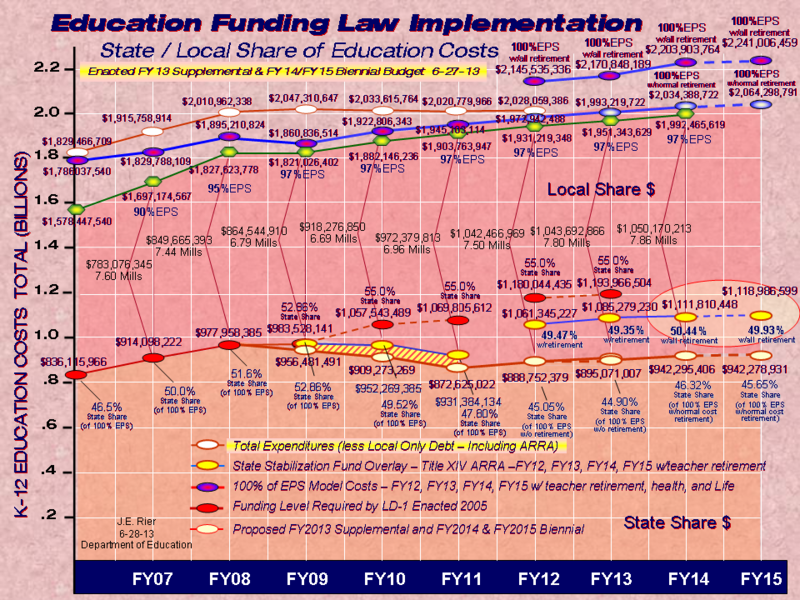 It requires the Department of Education to evaluate the multidistrict online learning programs that enroll students in one or more online courses, as well as the pilot project that enrolled full-time students, and to report the results of the evaluation to the joint standing committee of the Legislature having jurisdiction over education matters, which may submit a bill to the Legislature. ...directs the Department of Education to have an independent agency not previously involved with the essential programs and services funding formula review the essential programs and services model to analyze the impact of its implementation on children from economically disadvantaged areas, the funding shifts experienced by small rural schools and the result of the regional salary adjustment variable and the economically disadvantaged student variable on the equity of the distribution of state aid to municipalities for education and to provide a report to the Joint Standing Committee on Education and Cultural Affairs by December 1, 2011. The joint standing committee is authorized to submit a bill relating to the report to the Second Regular Session of the 125th Legislature. ...amendment replaces the resolve with a resolve that directs the Department of Education to enter into a contract for an independent review of the Essential Programs and Services Funding Act through a request for proposal process that awards a contract to a qualified research entity. The Department of Education is required to provide a report of the results of the independent review to the joint standing committee of the Legislature having jurisdiction over education and cultural affairs by January 31, 2013. The joint standing committee is authorized to submit a bill relating to the report to the First Regular Session of the 126th Legislature. The amendment also adds an appropriations and allocations section. 6/29/2011 - Carried over to any special and/or regular session of the 125th Legislature pursuant to Joint Order HP 1190. ...requires each school administrative unit to adopt, by August 15, 2012, a harassment, intimidation and bullying prevention policy based upon a model policy developed by the Commissioner of Education in conjunction with an advisory committee composed of representatives of parents, guardians, teachers, school employees, volunteers, students, administrators, community representatives, the Maine School Superintendents Association, the Maine Principals' Association and other interested parties. Harassment, intimidation and bullying prevention policies must be posted on the publicly accessible portions of the Department of Education's website and the respective school administrative unit's website. ...1. Establishes an education policy, core priorities for the State's education system, education system goals, benchmarks and intervention strategies; 2. Requires the development of a strategic plan to achieve the goals within the policy framework; 3. Requires that the state budget document present proposed expenditures on early childhood development, public education, adult education, higher education and workforce development in a manner that facilitates evaluation by the Legislature of whether funds are being appropriated and allocated in a manner that best accords with the established policy framework, advances the established goals and implements the strategic plan; 4. Requires that the Commissioner of Education adopt rules prescribing a uniform process for kindergarten screening in a manner that facilitates reliable and consistent measurement of statewide kindergarten readiness; 5. Requires school administrative units to award high school diplomas based on standards established by rule; and 6. Requires that, beginning with the class of 2015, students graduating from high schools demonstrate proficiency in the content areas of English language arts, mathematics, science and technology, social studies and health, physical education and wellness. Beginning with the class of 2018, students graduating from high schools must demonstrate proficiency in the content areas of career and education development; English language arts; world languages; health, physical education and wellness; mathematics; science and technology; social studies; and visual and performing arts. ...implements the recommendations of the stakeholder group established by the Commissioner of Education pursuant to Public Law 2009, chapter 626. The charge provided to the stakeholder group was to develop methodologies and recommendations relating to increasing high school graduation rates and to address other policy issues pertaining to school expulsion, suspension, zero-tolerance practices and truancy in the State. The bill accomplishes the following. 1. It requires the Department of Education to obtain more accurate and complete data in calculating high school graduation rates. In addition to calculating the 4year adjusted cohort graduation rate required by the Federal Government, the department is required to collect and record graduation rates for a 5year cohort and a 6year cohort and also use other descriptors of academic success for school-age students on a statewide aggregate basis, including the Department of Education diploma, high school equivalency diploma obtained through adult education and the general equivalency diploma. 2. It changes the law regarding compulsory school age by reducing the age when a child must start school from 7 to 6 years of age and by increasing the age threshold under which a child who has not attained high school graduation or equivalency is expected to attend secondary school from 17 to 20 years of age. The bill also amends the exceptions to the compulsory school age requirements. 3. It amends the truancy laws by striking all references to "habitual" truancy. It changes the provisions for determining truancy and removes the requirement that local law enforcement be notified of a truant student. It describes response to intervention teams for schools and their duties, including assessing situations of student truancy and developing and helping implement intervention plans for truant students. 4. It clarifies provisions pertaining to the qualifications and role of school attendance coordinators and requires superintendents to appoint attendance coordinators. In current law, school attendance coordinators are elected. It establishes that the salary costs of attendance coordinators are eligible for state subsidy under the Essential Programs and Services Funding Act. 5. It directs school boards to review policies and procedures established for the code of conduct and school discipline, including provisions that encourage school boards to focus the code of conduct on positive intervention and expectations rather than unacceptable student behavior and to focus school disciplinary policies on evidence based positive and restorative interventions rather than set punishments for specific behavior. The bill also requires that schools provide notice to parents or legal guardians of a student's suspension regardless of whether it is an in school or out of school suspension and discourages the use of zero-tolerance practices in school discipline. 6. It establishes due process standards for school expulsion proceedings to inform students and their parents or legal guardians of the procedural steps involved in and of their legal rights prior to, during and following the due process hearing and provide an explanation of the consequences of expulsion. 7. It amends the laws regarding school expulsion to require that all students who have been expelled from school must be provided with a written reentry plan, developed by the superintendent in consultation with the student and the student's parents or legal guardian, that provides guidance to the expelled student regarding what the student must do to establish satisfactory evidence that the behavior that resulted in the expulsion will not likely recur. 8. It further amends the laws regarding school expulsion to authorize school boards to provide educational services to an expelled student in an alternative setting. 9. The bill also provides for an ongoing appropriation of funds to the Department of Education to disburse to school administrative units that request funding for providing appropriate interventions to students who are at risk of becoming truants or dropouts due to an expulsion from school or who struggle with mental health and substance abuse issues. ...amendment makes the following changes to the bill. 1. It strikes the definition of "response to intervention team" and all uses of the term from the bill and replaces it with references to a student assistance team or the school personnel designated by the superintendent in accordance with the system of intervention established by the school administrative unit in accordance with the Maine Revised Statutes, Title 20‑A, section 4710. 2. It amends the due process standards proposed for school expulsion proceedings by removing the provisions pertaining to a student's right to appeal the decision of the school board to the Superior Court within 30 days. 3. It amends the provision that requires a reentry plan to be developed for a student who has been expelled by a school board by providing that: A. The reentry plan may require the student to take reasonable measures determined by the superintendent to be helpful to establish the student's readiness to return to school; B. The expelled student's parents or guardian are responsible for the cost of any professional services necessary to establish the student's readiness to return to school under the reentry plan; and C. For a child with a disability who is expelled by a school board, the superintendent may, as necessary, provide the reentry plan to the student's individualized education program team. 4. It strikes the provision that requires a school board to use suspensions and expulsions only as a last resort when taking disciplinary action against a student who has violated the school administrative unit's student code of conduct. 5. It amends the changes to the compulsory school age statutes by reducing the age threshold under which a child who has not attained high school graduation or equivalency is expected to attend secondary school from 20 to 18 years of age. The amendment also makes technical changes to clarify the exceptions to the compulsory school age requirements. 6. It strikes the proposed changes to the truancy laws that would have counted excused absences, as well as unexcused absences, towards the number of days of absences that would determine when a student is truant. 7. It strikes procedural provisions proposed in the bill and makes technical changes to clarify the role of superintendents, principals, attendance coordinators and the student assistance team or other systems of intervention established by the school administrative unit pertaining to assessing situations of student truancy and developing and implementing intervention plans for truant students. 8. It strikes the provisions in the bill pertaining to the qualifications of school attendance coordinators and the provisions that propose to establish that the salary costs of attendance coordinators are eligible for state subsidy under the Essential Programs and Services Funding Act.